Old school coffee makers don’t match our on-the-go lifestyle. They’re boring, they’re slow, and you end up with a lot of wasted, stale coffee. That’s why so many people get their coffee at the drive-thru. But it doesn’t have to be that way. You can save yourself a lot of time and a lot of money by getting a coffee machine at home. The Keurig k575 Single Cup Coffee Maker can have a steaming cup of coffee in your hands in less than 1 minute. With good options for coffee cups of all sizes, can the K575 keep up with heavy coffee drinkers and early mornings with the family? 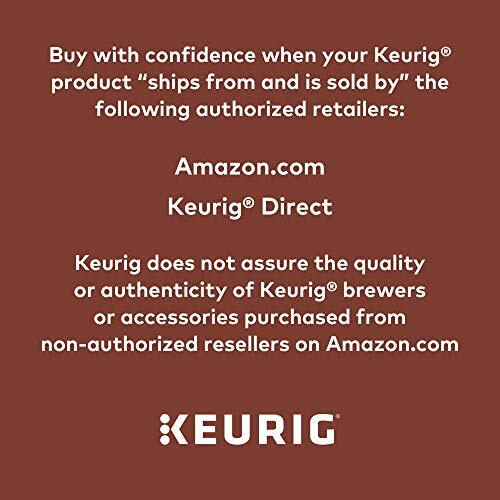 This is one of Keurig’s Plus Series Brewers. It’s the biggest and maybe the nicest of all their coffee makers. It’s got the most options for brew size, as well as more premium features. The large reservoir is wonderful because you won’t need to be constantly filling up the K575 coffee maker. You could brew 10 regular sized cups of coffee before having to refill it. Of course, if this machine isn’t being refilled every day, you may want to change the water to keep it from going stale. Freshly brewed coffee using stale water may actually affect the taste. Luckily, it takes a minute to refill the reservoir. The reservoir also has a cool night light feature that makes brewing those extra-early cups of coffee a bit easier. What sets this coffee maker apart is the ability to make so many different cup sizes. You can do a regular cup of joe, which uses the regular K-Cup pod, in either 4, 6, 8, 10, or 12 ounces. Then it uses the K-Mug pods, which are designed to make stronger and bigger cups of coffee in 12 to 18 ounces. Finally, you can use the K-Carafe pod to make a pot of coffee, in 22, 26, or 30 ounces. You can make virtually any normal size cup of coffee! And if it’s going to be a long day or if you are hosting company, you can make a whole carafe with not much more effort or time. This is the most versatile of all the K Cup coffee makers. Customization is everything. Do you like very hot coffee? Perfect. Want it a bit more tepid? There aren't any Keurig problems to do that. With the k575, there are 5 different temperature settings. If you need your coffee strong as I do, then simply turn on the strong brew setting. No matter how you brew your cup, the actual brew cycle takes less than 1 minute (3 minutes for the K Carafe). The touchscreen display is what makes it feel like a modern coffee maker. It’s a decent size and crystal clear. The display has a digital clock when not actively being used. It’s also the command center of the coffee maker, so here you can adjust the auto on/off settings, program a brew time for each morning (imagine a coffee maker that makes you your own cup of coffee before you’re up every morning! ), and turn the nightlight on or off. You can even customize the wallpaper, which is frivolous and fun. The Keurig k575 comes with three accessories: a water filter handle and 2 water filters. It also comes with a maintenance kit for cleaning the needle. You need all of these things to keep your machine running normally! This machine comes with a sampling of K Cup coffee pods (6 count). It’s a great way to try out all the settings and learn to use the machine without wasting your own coffee. While all of these are great, the one that you’ll probably get the most use out of is the K-Carafe, so that you can get the most use out of the different brew size settings. One thing I don’t like is the height - it’s too tall. You can’t store it in a cabinet in your kitchen because you won’t be able to open the top to put the K-Cup in. And it hogs a lot of precious cabinet space. I don’t love the strong brew setting. Since Keurig coffee is notoriously weak anyways, it only gets a tiny bit stronger when you do the strong brew. The strong brew setting is a bit misleading. But here’s what I like. The premium features and nice design make this thing very loveable. The reservoir is several ounces bigger than the other Keurig models, which equates to a few more cups before a refill is needed. The touchscreen is the biggest they offer. And it’s the only model that accepts the K-Mug Pods, which are the perfect option for this on-the-go momma who needs a bigger, stronger cup of coffee, and fast. 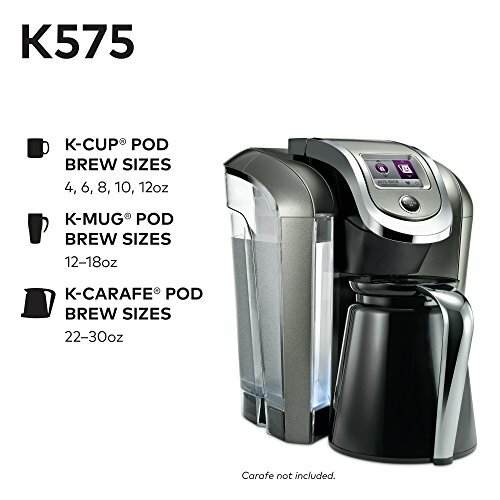 Who is the Keurig k575 For? This coffee maker is for those who want fast coffee. You can make any size cup in under a minute and the carafe in 3 minutes. People low on time (basically all of us) will appreciate the speed. People who drink their coffee one cup at a time will benefit from a Keurig k575. No wasting extra coffee because you only drank 1 cup. No reheating stale coffee later in the day. No arguing about coffee flavors with your family. Get what you want, when you want it. This Keurig k575 is not for people on a budget. It’s one of the nicest, and therefore most expensive Keurig model. The accessories aren't cheap either. And the coffee pods are certainly more pricey than regular coffee and even some of the best coffee filters. This is not for coffee connoisseurs. K-Cup coffee is not the most flavorful or rich coffee. It can taste borderline bad when compared to a delicious cup of regular drip brewed coffee. It is 13.2 inches high when closed and 17.55 inches tall when the lid is up for pod insertion. Consider that the space between counter and upper cabinet is almost always between 15 and 20 inches. For most of us, that’s not a lot of wiggle room for working under the cabinet. How long does it take to brew cup or carafe? Keurig claims that you can brew any cup of coffee in under a minute. I’m not sure if that includes preheating time or not, but if you are brewing a big cup and the machine has to preheat, I would say that it’s closer to 2 minutes. The K Carafe takes about 3 minutes to brew. Can you brew your own coffee? Yes. If you buy the My K-Cup Pod or a similar accessory, you can fill it with your ground beans of choice and make a custom cup of coffee. Temperatures vary based on size. For the K Cup pods (regular cups of coffee), it has a low value of 182° F and a max of 192° F. For the K Mug and K Carafe pods, it’s a bit hotter to keep it from cooling so quickly. The low for these is 187° F, and the high is 197° F.
Can you fit a travel mug? You can easily fit a travel mug under the machine to brew directly into it. The drip tray is removable to accommodate most normal sized to-go mugs. What types of pods/cups does it use? 2.0? Non 2.0? This is a 2.0 system and was designed to use 2.0 pods. You can try to use a non-2.0 pod, and it might work, but you might get an error message and not be able to brew coffee. Most of the major brands make 2.0 compatible coffee pods. Can it overflow when brewing? There are no sensors to keep it from making a mess. Once you select the size you want, that much liquid is dispensed no matter what. Be careful when trying out new mugs! You should replace the filter every month. Your coffee will taste better, and you’ll help to avoid mineral buildup in your machine. It’ll also keep bacteria from collecting in your machine. Does it turn off automatically? The K575 has a few power options. You can power it up or down manually using the button on the touchscreen. You can set it to turn on at a certain hour and turn off at a certain hour. It can also be set to energy saving mode, where it will turn on when you tap the screen or lift the lid. This may be the best Keurig available right now, so there aren’t really any more options that need to be added as far as making coffee is concerned. Which is nice, but sometimes the machine is so fancy that it can be fussy and oversensitive. They need to improve the sensors and settings so that the k575 doesn’t fight with its users so much. What I wish that they could fix is the water pressure. Especially with this k575 model, the water can make a big mess of the coffee grounds when brewing. The machine requires constant cleaning and coffee grounds can make their way into the cups of coffee. Another thing that needs to be upgraded is the heating mechanism. They made the reservoir and capacity so much bigger for the k575, but they didn’t upgrade the heater. It takes a long time to preheat and has to do so constantly. This Keurig is virtually the same as the k575. All of the other settings and sizes are the same. You’ll get the same cup, mug, or carafe of K Cup coffee for a slightly lower price. This Cuisinart has the same functionality as the k575 with a very different design. You can buy other single serve coffee makers, but they typically won’t have as many settings or be as versatile. 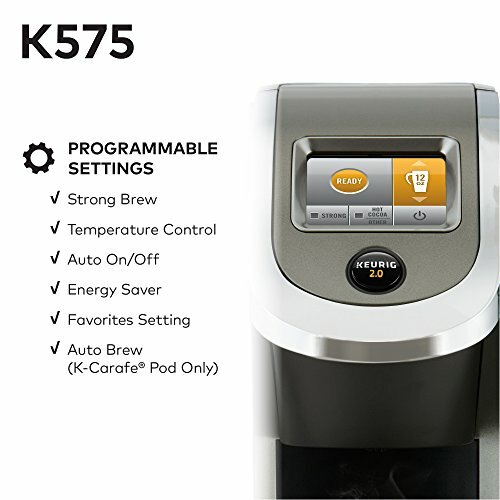 The Keurig k575 is nice as far as Keurigs go. You can fully program it to do whatever you want. You can make coffee in nearly any size. And it makes coffee ridiculously fast. Sure, if you like strong coffee, K Cup coffee can seem a bit weak even when brewed under the “strong” setting. But for most of us regular coffee drinkers, it isn’t unbearable. And the time and money savings make the taste worth it.